At least 48 people have been killed and as many as 500 others have been injured in a chemical attack in Ghouta near the Syrian capital, medics say. A search and rescue operation is ongoing. The attack happened at 7:45 p.m. local time on Saturday when airstrikes were carried out in rebel-held Eastern Ghouta near the capital Damascus. The exact circumstances of what happened were not immediately clear. 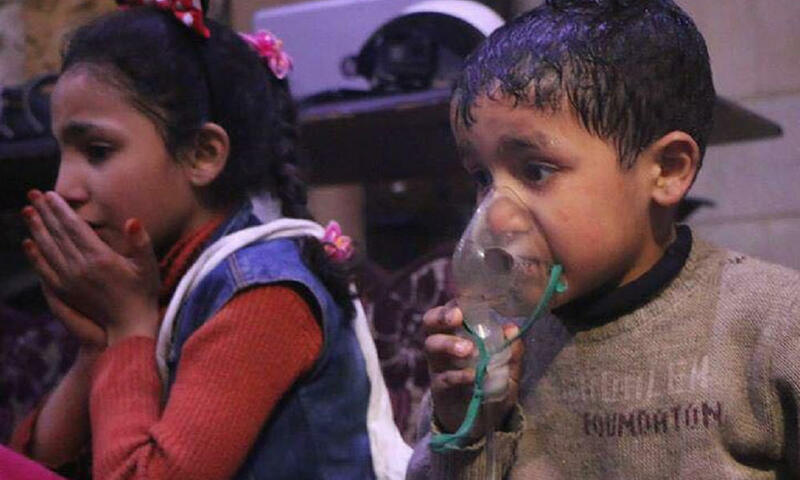 A photo shared by UOSSM shows 2 children after a chemical attack in Ghouta, Syria. The White Helmets, which is a group of rescue volunteers, said a helicopter dropped a barrel bomb containing a chemical agent in the Douma area of Eastern Ghouta. It said entire families suffocated to death in nearby homes and shelters. A search and rescue operation was ongoing on early Sunday morning, but the White Helmets said at least 48 people had been killed and as many as 500 others have been injured or sickened. There were conflicting reports about the death toll, which various sources put as low as 21 and as high as 150. Footage spread on social media showed dozens of dead people, including children, who appeared to be suffering from symptoms consistent with a chemical attack. Many of the victims had white foam coming out of their mouth. It comes just over a year after a chemical weapons attack in northwest Syria, killing at least 92 people. The U.S. and other countries attributed the attack to pro-regime forces, even though the Syrian government strongly denied any involvement. The U.S. bombed a Syrian airbase in response. It was not immediately known how the U.S. might respond to Saturday’s attack, but an official at the U.S. State Department called the reports “disturbing,” noting that sources on the ground indicate a potentially high number of casualties. Editor’s Note: An earlier version of this article cited The White Helmets as saying 150 people had been killed. The organization later retracted the report and said the death toll was at least 48. The number of casualties remains unclear, with various sources putting the death toll as low as 21 and as high as 150.